Did The Deputy Chief Minister of Nagaland Just Cast 8 Votes? Did Deputy Chief Minister of Nagaland, Y Pattan just vote eight times over? Well, according to a video going viral on the social media —and now posted by the Congress party as well—Pattan, wearing a BJP scarf, enter the poll booth, and with seven to eight voting slips proceeds to cast his vote(s). 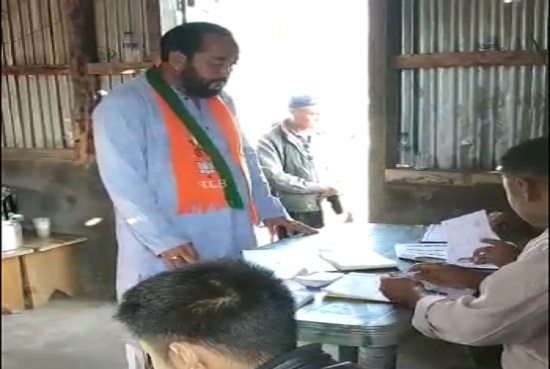 The video was recorded at polling station number 31 at Riphiyam old -111 under TYUI assembly constituency in Wokha district in the first phase of polling on April 11. This is not the first time Y Pattan has taken law into his own hands. In 2012, he was caught with more than Rs two crores in cash in his vehicle in Wokha district. He has been also been seen as instrumental in getting DGP Rupin Sharma transferred from the state, a police officer well regarded for his integrity and honesty in the state. Condemning what it called an “irresponsible” and “blatant act”, the NPCC said it had apprised the Nagaland chief electoral officer Abhijit Sinha to take cognizance of the “shameful act” perpetrated by none other than the deputy chief minister, who also holds the home portfolio. Speaking to The Citizen, an IAS officer from Wokha district currently on poll duty, called such violations as normal and accused the media of ignoring such reports from North East. “These kind of poll violations has been very normal, proxies are there to vote in large numbers under the influence of the ruling party, and the only difference is that this video showed the deputy chief minister himself involved in acts of rigging the election”, he said. “Apart from this, in certain polling booths yesterday, there was clear pressure from local village observers and councils to make sure that polling goes up to 90 % and in favor of the ruling party. Poll officers do whatever they can to curb this but it’s so rampant that it becomes difficult to control it at a mass level. The problem is systematic and must be addressed by the election commission,” he said.